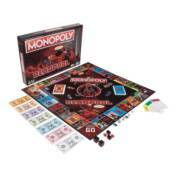 Deadpool meets the Monopoly game - like peanut butter and fried trout, it's a perfect match! In the Monopoly: Deadpool Edition game players build their own team of Mercs for Money as they purchase the contracts of the world's best mercenaries. Some are Deadpool's allies, some are Deadpools from alternate universes, and one is just Deadpool in a maid outfit. Other players have to pay a fee when they land on Mercs. Get ready to wheel and deal, buy vehicles like a chimichanga truck, and steal friends' stuff with the Cheap Shot And Low Blow spaces.